Window perf, short for perforated window film, can be used to display advertisements on storefronts and vehicle windows without blocking the outward view. Created with durability in mind, window perf easily withstands exposure to sunlight and other elements. While it is most often used for business purposes, it can also be used by homeowners to decorate a home, either permanently or temporarily, such as for celebrations. Here is more about the advantages of our Los Angeles same day window perf services and the options clients can choose. 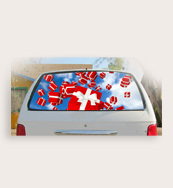 The key feature of window perf is its one-way transparency. While this window film creates an apparently opaque image on the side intended for viewers, those on the inside can enjoy a shaded view outwards. This can be ideal for a number of applications. For example, bus advertisements commonly use window perf to cover the entire height of the side of the bus with an advertisement, because it doesn’t prevent passengers from seeing their stops. For stores, getting same day window perf in Los Angeles can boost advertising space on their front windows without preventing personnel from being ready to greet customers. 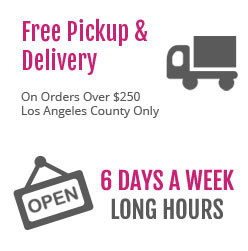 Our Los Angeles same day window perf services include design and printing in one location. For design of the window perf, our graphics team can create new images or work from the ideas that clients offer. Once the design is ready, printing can be performed in small or large-format sizes. With high-quality inks and other materials, these window perfs can last for up to three years. Our print shop can also produce window perfs in runs of virtually any size to cover as many windows as there are necessary. Window perf is a versatile and cost-effective advertising option that can be used to promote products and services on vehicles or storefront windows. For consumers, this product can be a unique addition to decor for parties and other events. Clients who choose us for same day window perf in Los Angeles have access to an array of inks and other materials to achieve the effects they seek. To learn more about our window perfs and other Same day printing in Los Angeles, clients can contact our printing office online or by phone.